Hit all top Hollywood's movie-making landmarks and pop culture sights on this 3-hour Private Hollywood Tour with your friendly local guide. Flash back in the past century at the Hollywood Roosevelt Hotel and Amoeba Music. 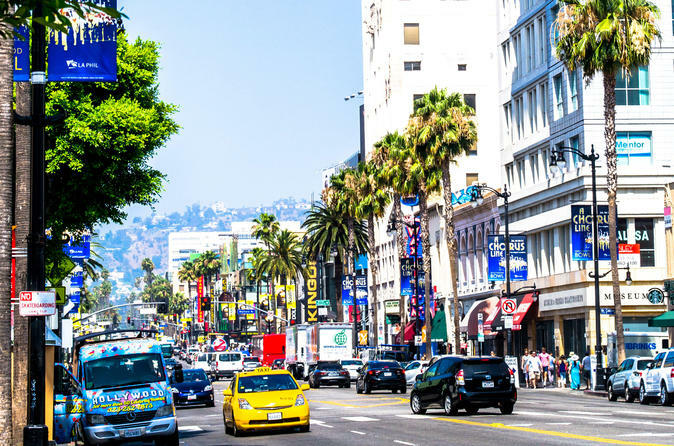 Stroll along the Hollywood Walk of Fame, marvel at the Hollywood sign and visit Hollywood's hot spots like Pantages Theater, Dolby Theater, Chinese Theater and Capitol Record Tower. This is a walking tour that makes some use of the metro, but begins with pickup from your hotel lobby. Timing is flexible and you can start the tour any time you prefer. This tour can be customized to make it a unique experience for you. Your private local guide will meet you in the hotel lobby and discuss the tour itinerary with you at the beginning of the tour. 10am Meet your guide in the hotel lobby and start your fun tour from there. See the timeless twelve-story Hollywood Roosevelt Hotel built in 1927. Feast your eyes on exquisite combination of relics of the past and contemporary aesthetics. This architectural landmark of Spanish colonial design hosted the first Oscars ceremony in 1929. Learn a lot of old Hollywood history and glamour wandering along the Walk of Fame. 11am Learn the story behind the Capitol Records Building. The next Katy Perry could be in this iconic building right now, laying down tracks in studios engineered by Les Paul. Take a quick coffee break while your expert tour guide entertains you with amazing stories about Hollywood celebrities. 11.30am Amoeba Music. Flip through encyclopedic selection of new and used CDs, videos and vinyl, as well as band-themed T-shirts and music posters at this music junkie's paradise. 12pm Hollywood Forever Cemetery (optional, if time permits). Check out embellished monuments, vainglorious tombstones and epic mausoleums of the Hollywood’s greatest movie stars. 1pm Make a pilgrimage to the Dolby Theater, a first-class live entertainment spot that hosts the Academy Awards. The Hollywood Highland shopping mall is a fitting finale to your revealing tour of Hollywood’s best kept secrets. Steeped in Hollywood history, this entertainment center annually hosts exclusive Governor’s Ball and Oscar celebration. You can easily spend a couple hours here browsing more than 70 brand-name retailers and LA’s finest eateries. Do not miss the highlight: a triumphal arch. You may want to check out these museums on your own after the tour: Hollywood Museum, Hollywood Wax Museum, Ripley’s Believe it or Not! and Guinness World Records Museum.